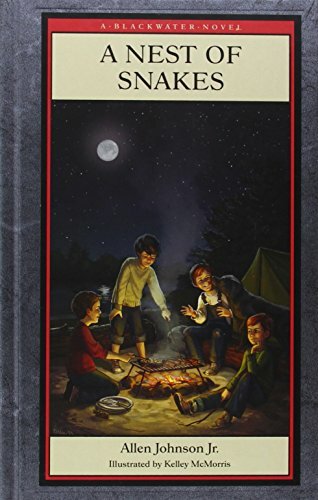 Synopsis: This third title in the Blackwater Novel Series by Allen Johnson Jr, is a 2014 Moonbean Children's Book Awards Silver Medal reciepient. The twins, while sleeping in their tree-house, overhear a plot. Later, they return to the Blackwater River to connect with Rad Fox and help Linc and Sheriff Clyde who are in danger from the Ku Klux Klan. Once again, good people join together to confront racial hatred. About the Author&colon; Award winning author Allen Johnson, Jr. talks about his family and what has brought him to write his three Blackwater Novels from Premium Press America. Johnson said,I live on Mercer Island, Washington, near Seattle, with my wife Jill, my filmmaker son Ben, who is now a weekend visitor, and three dogs; Sunshine, Piccolo, and Chloe. My daughter April, who is currently making a documentary film, lives nearby in Seattle, and my oldest son, Colby, a filmmaker, lives in New Orleans. I have to wonder if a gene for filmmaking runs in my family! At the age of seventy-eight, I now pursue my two passions: writing and jazz guitar. I was born and raised outside of Birmingham, Alabama. You can take a Southerner out of the South, but you can't take the South out of a Southerner! As a boy I had the good fortune of growing up with the space and freedom to be outside, have adventures, explore, and get into trouble. A boy's purpose in life is to have fun, and the tantalizing possibility of getting into trouble added spice to that purpose. I was also blessed with a rich heritage of storytelling from the members of my wonderful, extended Southern family. I share some of my family stories in the Blackwater Novels. My boyhood in the South and my college years at the University Alabama also gave me first-hand experience of good people coming together with love to help each other and to confront racial hatred. I am grateful to my Southern past for giving me the rich experiences to draw on in writing the Blackwater Novels. I consider the books to be parables on how to live. This may explain why some things work out better in the novels than they do in real life.